I am so excited to finally be sharing about my Invisalign treatment with Dallas Dental Concierge. I have had so many questions after sharing about it on Instagram Stories so today I am answering all your questions. 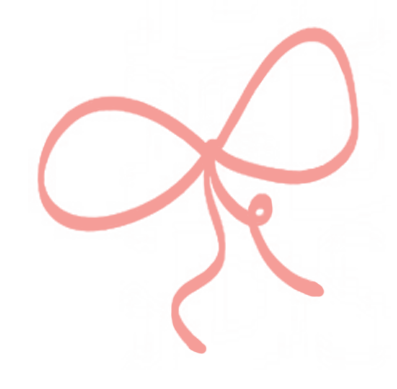 Plus, keep reading for a special offer on Invisalign for my readers! This post is sponsored by Dallas Dental Concierge. Thank you for supporting brands and companies I love. Dr. Melisa Christian of Dallas Dental Concierge is a respected general and cosmetic dentist in Dallas, including the chosen dentist of many professional athletes in town. She came highly recommended by my friend, Andrea Overtruf of the Loubies and Lulu blog, which put me at ease with such a big decision having to do with my teeth. (Read Andrea’s experience here as she is almost finished with her treatment.) Plus, Dr. Christian has a lot of experience as an Invisalign certified dentist. The nice thing about Invisalign is that it’s down to a fine, computerized science. At your first consultation Dr. Christian will use her computer simulator to show you exactly what what your teeth will look like when treatment is complete. She also takes 3D scans of your mouth that Invisalign will use to make lightweight, clear retainers. At your second appointment you will receive these retainers. Each retainer is numbered so you know exactly which ones to put in each week (or two weeks depending on treatment plan). There is no guesswork with Invisalign, which I love! Why did I chose Invisalign? I had traditional braces as a teen but I didn’t wear retainers and my teeth shifted. I couldn’t stand the thought of going back to metal braces. My goal here is not perfect teeth, but just better, straighter teeth which is why I chose Invisalign. There aren’t a lot of appointments involved. There is the initial consultation where they take 3D measurements (no sticky molds!) and then the second appointment when you get your Invisalign retainers. After that, you just go in every few months. So nice for a busy mom like me! I didn’t want the look of metal braces. As a blogger, I do a lot of photos and videos and speaking engagements so I liked the idea of being able to take out my Invisalign retainers. I can still eat everything because I take the Invisalign retainers out to eat. It varies by person and by case. My case is on the more “severe” end of the spectrum. It will take 20 months. Andrea, who I mentioned above, only has to wear hers about six months. 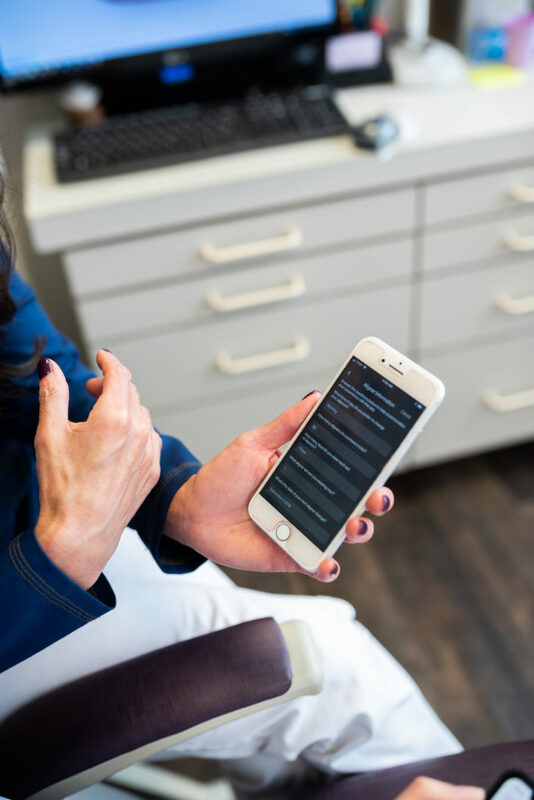 You can follow your progress along in the Invisalign app that will remind you to change your retainers and keep you on schedule. Cost range is $800-$5500 and is dependent upon complexity of the case and length of treatment required to resolve all patient concerns and desires. Some patients just want a few teeth addressed, some want a full mouth makeover. Some are teens and college kids who had braces but didn’t wear their metal retainers:). Dr Christian will make recommendations for each person and will give them options addressing ideal treatment vs their personal goals. 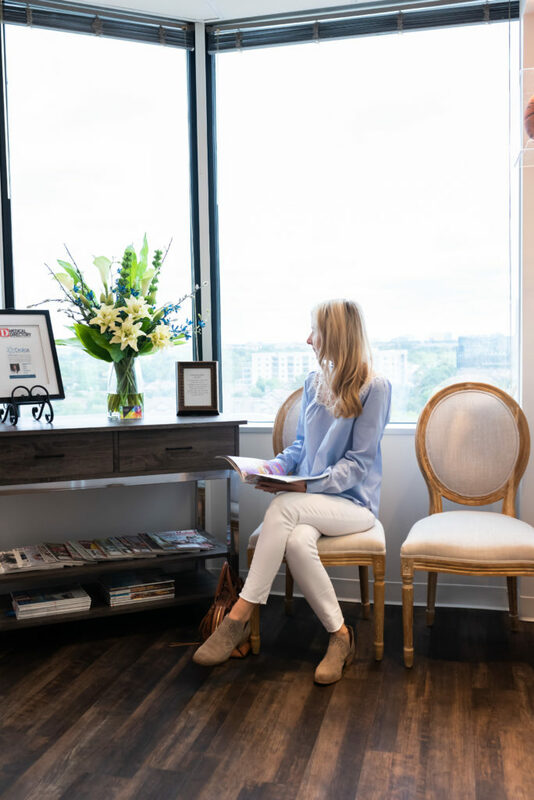 Special offer: For DoSayGive and Loubie and Lulu readers, Dallas Dental Concierge is offer a free consultation (where you can see before and after simulated images!) and 20% off Invisalign if you start the process before the end of the year. This is a GREAT deal! The first few days I definitely had to take some Advil! I could tell my teeth were shifting, which is a good thing. And my gums were a bit cut up from the new plastic in my mouth. But after that my mouth adapted and I got completely used to it. Dr. Christian also recommended I use this Vibrating Device to help alleviate pain and help seal the Invisalign retainers. It actually feels really good to use this thing the first day or so after switching out my Invisalign retainers. How often do you change out retainers? Some patients it’s every two weeks; for me it’s every week. What if you lose retainers? No problem! Dr. Christian can order more for you at no charge. If this happens, she tells you to wear the previous week’s retainers (and gives you a retainer case for it) so you won’t backtrack a lot on progress. How is Invisalign different than Smile Direct Club (which I see on my Facebook feed all the time!)? Let me quote Dr. Christian: “Invisalign utilizes far superior, user friendly, discreet plastics compared to the Smile Direct Club. Invisalign has been manufacturing and investing in their incremental retainer system since 1997. Since that time, patient cases continue to improve exponentially for the simplicity and comfort of the patient. It is always best to work closely with a dentist with any tooth movement procedure because every tooth movement may not transition as expected. When this occurs, a dentist can immediately intervene during the case for a seamless successful completion. With Smile Direct Club, a person will not know if the case meets their satisfaction until the end. At that point, they would need to proceed with customer service to problem solve what went wrong. Call Dallas Dental Concierge to book a free consultation! Their number is 214-760-6035. 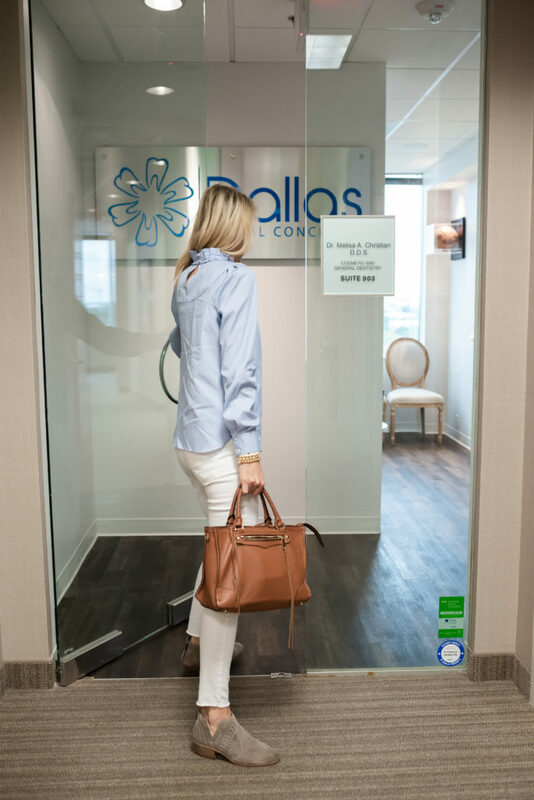 Where is Dallas Dental Concierge located? 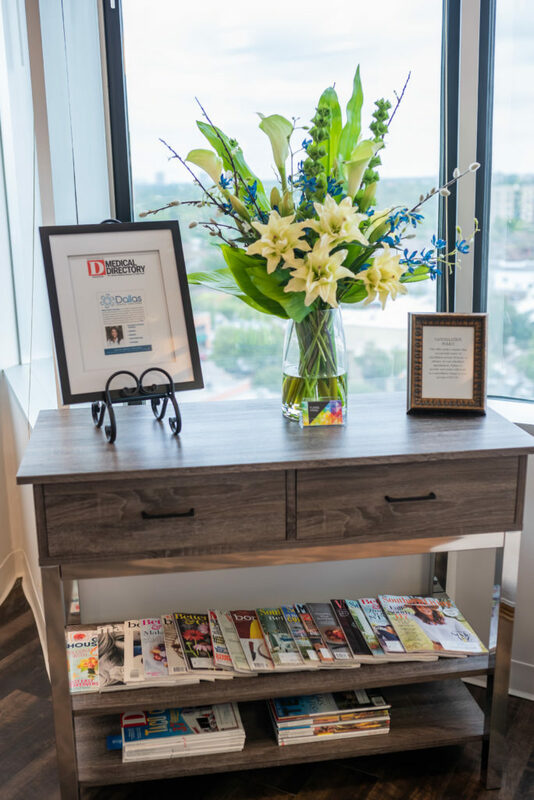 Dallas Dental Concierge’s modern office is located in the Knox Henderson area of Dallas (right across from Trader Joe’s). Parking is easy (they will validate the parking garage underneath) and the office staff is so friendly! What was the biggest surprise about Invisalign? One thing I didn’t realize about Invisalign is that in some cases the dentist has to glue invisible bracket-like attachments (more like clear bumps) to help the retainers work more efficiently. These aren’t noticeable to others but do take awhile to get used to. After four weeks I hardly notice them. Any more questions about Invisalign? Ask in the comment section below! And head to Loubies and Lulu to read about her positive experience with Invisalign. And don’t forget to mention DoSayGive when you book your first consultation for 20% off Invisalign if you get them before the end of the year! I’ll be posting more updates throughout my treatment plan on Instagram and Instastories. Can you recommend someone in the Houston/Katy Texas area?! I can’t! I will ask Dr. Christian the next time I go though!